We can all agree that nothing says “summer” more than the smell of barbecue on the grill. But, why am I talking about summer in January? Well, because LA (or global warming) has graced us with 80-degree weather all week. After spending a couple wintry weeks in the midwest over the holidays, I was pleased with the warm welcome (literally) home. But, even if Jack Frost is nipping at your nose and summer seems like a figment of your imagination, you can still enjoy this dish–I’m looking at you, Wisconsin. What makes this meal so bright and summery is the fresh avocado mango salsa, but the chicken can stand alone as the main protein for any meal. An outdoor grill is the best way to get that smoky barbecue flavor, but even I don’t have access to that. However, if you have a cast iron skillet or grill pan, you can get similar results. And if you don’t have that, just use any damn pan you want. To marinate the chicken, I used my homemade sweet and spicy BBQ sauce, but any store bought sauce will do. I love this dish because it packs big flavors with little fuss. If making homemade sauce, follow the instructions for my sweet and spicy BBQ sauce (above) and let cool. If using store bought sauce, uh, just open the bottle. Combine sauce with a drizzle of olive oil in a large ziplock bag and add chicken to marinate. Make sure chicken is completely coated and store in the fridge for 24 hours. I found that allowing the chicken to marinate for a day provides the most flavor, but you can do it for less time if you want. 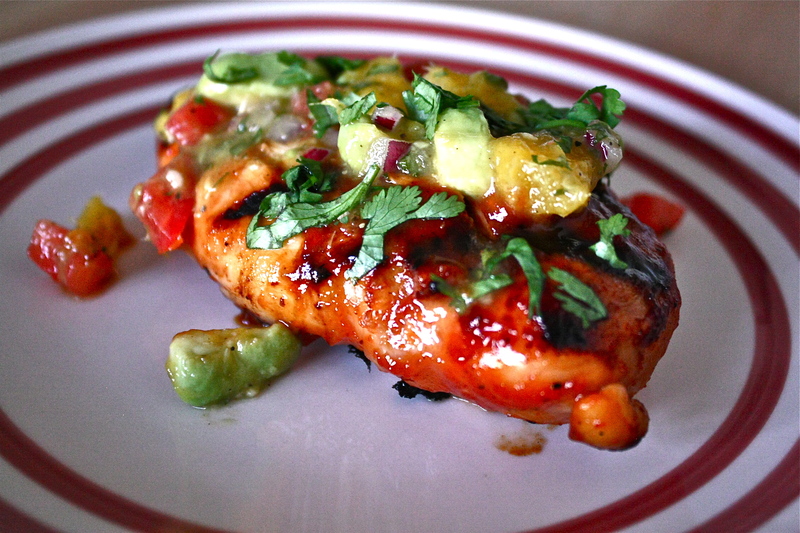 While the chicken is marinating, make the mango avocado salsa (above). The longer you allow the flavors to meld, the tastier it will be. I usually allow at least an hour in the fridge. Heat up your iron skillet (or grill pan, or whatever pan you own) and spray with non-stick spray. Add the chicken breast and brush occasionally with the sauce. Cook chicken until it’s opaque, with no pink in the center. I usually make a slit in the thickest part of the breast to check for this. Plate chicken and top with additional sauce and avocado mango salsa (optional). *The sugars in the BBQ sauce can cause it to burn and smoke, so make sure to use a vent if you are cooking indoors. If not, you should probably unplug your fire alarms.